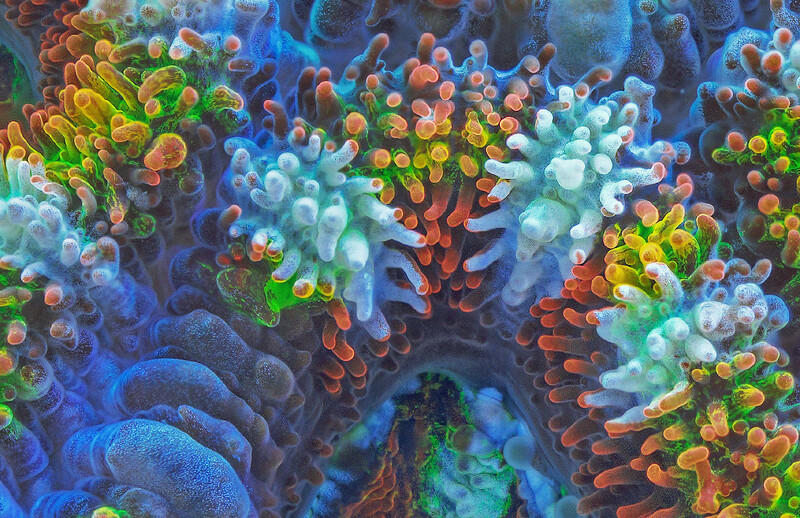 You can immerse yourself into microscopic worlds when you get a large luxurious museum-quality fine art print of coral macro, microscopy, and ocean art topics. 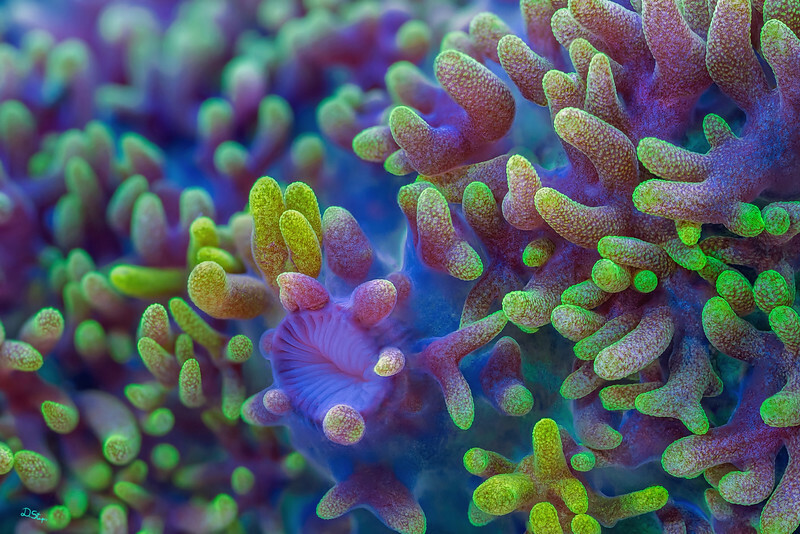 Acanthastra lordhowensis coral is an exceptionally interesting and colorful creature. 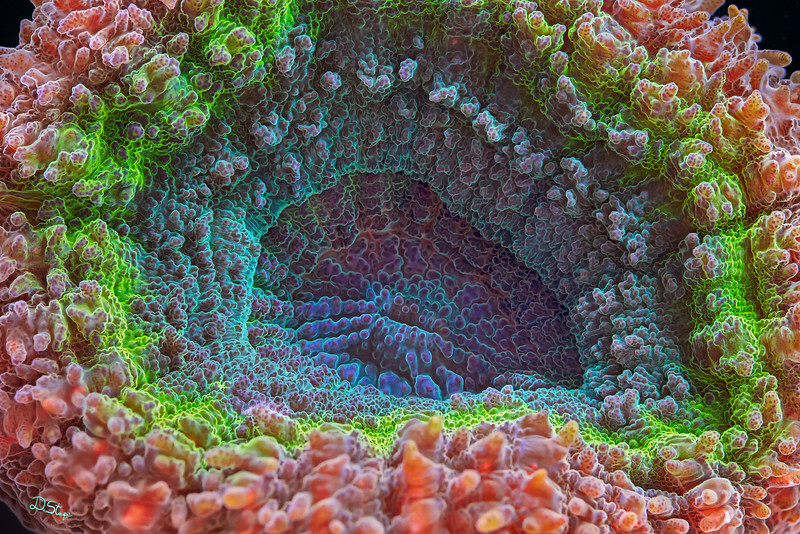 It catches your eye on the reef, however under close inspection it becomes even more fascinating. The whole area of this complex image occupies just a few square centimeters, but looks like a landscape of another world. Example of a close-up that shows resolution potential of this image. I knew it was a very special photo (focus stack to be precise) even when I was taking it. The image won a place in the Australian Geographic Photographer of the Year 2014 contest. Acropora corals are about the trickiest animals to identify. They dominate on the Pacific reefs, often creating large colonies. Most of them are not so colorful. I was lucky enough to be able to find this specimen with such color combination and composition - had to look through hundreds of branches. 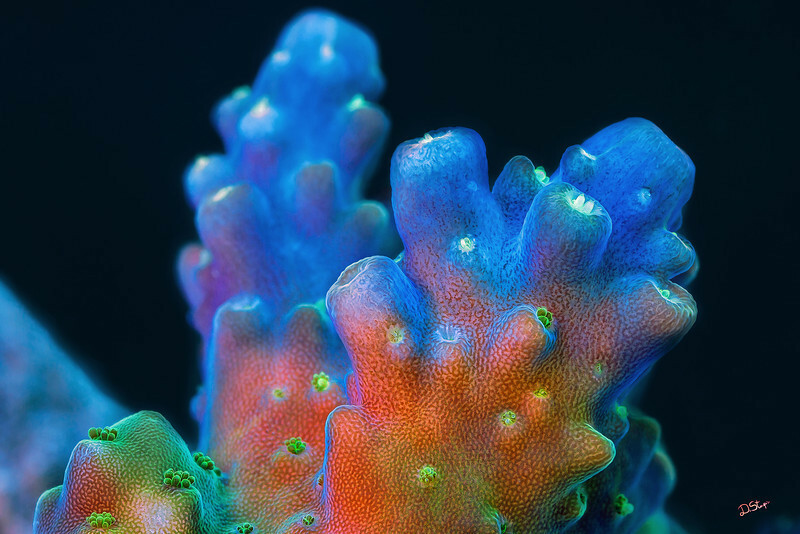 Acropora is the major reef building genus in the tropics and responsible for most of calcium carbonate deposits. 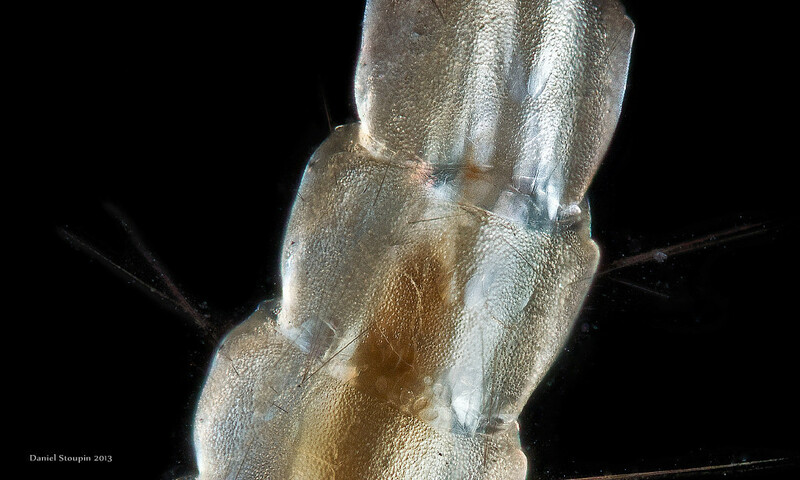 Rhodactis sp. corallimorph looks nothing like what you see on this image, unless you have a microscope. This is one of the most time consuming and patience-demanding images that I've produced. I had to wait for hours till the animal was facing me under the correct angle and then take hundreds of shots praying that it wouldn't move too much. The end result was worth it after a week of processing and manual focus stacking. To give an idea about scales, the area appearing on the image is around one third of a thumb fingernail. The image led Greenpeace Great Barrier Reef campaign in 2015. Raibow Lobophyllia (Possibly Lobophyllia hemprichii). 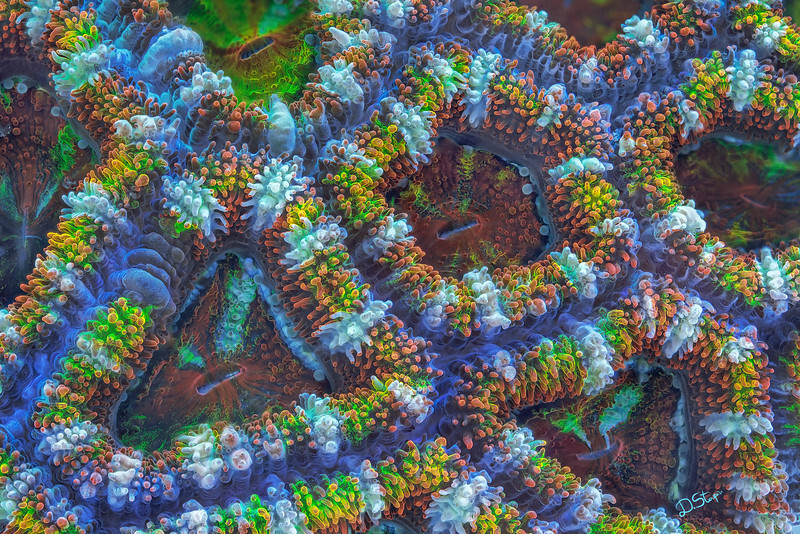 This coral is not very rare, however its beauty is easy to miss. Without close inspection it looks green and red on the edges. But once you magnify it, it takes your breath away with the surreal landscape and color combinations. The distribution of fluorescent pigments in such rainbow layers is very mysterious and most likely plays a vital role in the life of this association between a cnidarian (the visible coral itself) and its countless inseparable symbionts (algae and microorganisms). 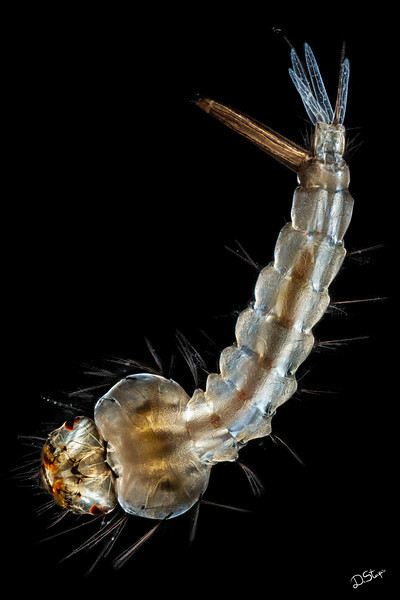 An exceptionally detailed image of a mosquito larva. Upon close inspection of the print you will be noticing the tiniest circulatory vessels and nerves. Mosquito adults might be annoying insects that you slap on daily basis. However, their larvae are peaceful water-dwelling creatures that look gorgeous up close. This aquatic larva tested my patience to the very limits. To get this focus stacked panorama I had to manage to take hundreds of shots before the insect moves. And it wiggles a lot! After entire day of trying, I got it standing still for a few minutes and left it unharmed. The preview cannot render all the features that you will see on a print. To get an idea, that's a close-up. Any print size is possible. The bigger, the better. I insist on metallic paper or metal print for recreating realistic shine and reflections of the insect.